After the deluge of new entries over the previous two weeks - 16 in total! 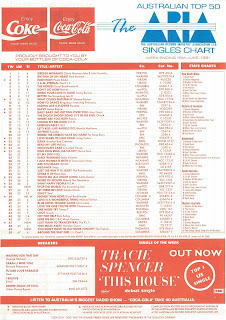 - it was inevitable that the ARIA top 50 singles chart would slow down again. This week in 1991, only four songs made their debut (and in subsequent weeks, that would drop to three and then two). Luckily, there were some big singles among those few debuts. Among the four new tracks arriving this week in 1991 was the second top 10 hit for the duo who'd end the year as the best-selling singles act in the world. The best-selling single in Australia this week in 1991 was still "The Grease Megamix" by Olivia Newton-John and John Travolta, who were once again making themselves very comfortable at the top. Last seen on the top 50 with 1988's "Dreaming", OMD - which at this point was just singer Andy McCluskey - returned with this lead single (and future WA top 5 hit) from Sugar Tax. Like so many American pop and R&B singles in 1990-91, "This House" had been a big hit at home (number 3 on the Billboard Hot 100) but fell between numbers 51 and 100 in Australia as a result of exposure on syndicated radio show American Top 40. Not that you could tell by looking at her, but former Star Search contestant Tracie Spencer was only 14 when she released "This House", although she'd actually been a recording artist since the age of 11. The pop/dance track that sounded like it could've been produced by C+C Music Factory (as so much else was in 1991) was Tracie's most successful single. Here's another song that charted highly in the US (and was therefore first heard locally via American Top 40), but didn't perform so well here. Like a cross between Wilson Phillips and Nelson, The Triplets was comprised of, well, triplets - sisters Diana, Sylvia and Vicky Villegas. Their music was just as middle of the road and over-produced as either of those other groups, and I'm actually surprised "You Don't Have To Go Home Tonight" didn't do better here since it's the sort of safe pop/rock track that FM radio loved in the '90s. But I can't say I'm disappointed about it. With "3 A.M. Eternal" firmly ensconced in the top 5, The KLF continued their assault on the ARIA chart with the just-as-exciting follow-up, "Last Train To Trancentral", the latest in their series of stadium house classics. Once again, the 1991 single version, subtitled "Live From The Lost Continent", was a reworking of the original Pure Trance version and was also quite different from the album mix, which featured much more rapping from Ricardo Da Force. Result: a second consecutive top 5 smash. 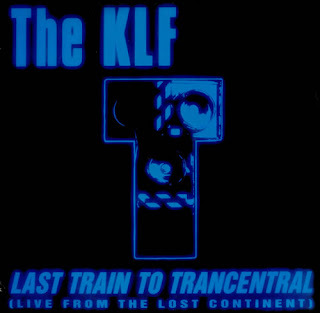 Full of references to The KLF's bonkers mythological world and, obviously, to the group themselves, "Last Train To Trancentral" actually got its name from the duo's studio, Trancentral, which was in the basement of the terrace house where Jimmy Cauty lived. Our next two new entries are under-performing follow-ups to massive hits by local artists. First up, it's the third single from Rise, which failed to get anywhere near as high on the chart as its chart-topping predecessor "The Horses". Possibly working against the rousing "Higher Than Hope" was the fact that people were finally starting to pick up the album, with Rise having just peaked at number 3 as part of a five-month stay inside the top 10 that resulted in it winding up as the year's highest-selling album (even if it never actually reached number 1). The song did, however, give Daryl his one and only appearance on the Billboard chart with "Higher Than Hope" reaching number 47 in the US. Fun fact: the man who likely inspired Daryl's comeback supplied backing vocals for "Higher Than Hope". Yep, that's John Farnham you can hear in the background. Possibly also suffering from the fact that people were buying its parent album was this follow-up to number 4 hit "Better". Unlike Daryl's album, The Screaming Jets' debut offering, All For One, had been an instant smash, debuting at number 3 - and by this point had dropped no lower than number 13. The other reason "Stop The World" might not have done so well on the chart was that it didn't have the crossover appeal of "Better", which even a non-rock fan like me didn't hate. It was just as noisy and hard-edged, but didn't have as strong a hook. Still, it was early days for the band. Next week: we're down to three new entries - and it's an all-Australasian trio, featuring singles by two male vocalists who were stepping away from the bands with whom they'd found fame. I absolutely love The KLF, and all the mystique that surrounds them. I have to admit I was a little disappointed that when I finally bought a copy of The White Room that it contained a different version from what I was used to but I have come to embrace it. I was a HUGE fan of Higher Than Hope. It was my favourite song for a while in '91. Unlike you rock music was where it all started for me with the likes of Def Leppard, Poison, Motley Crue and Bon Jovi in the late 80's when I was around 5 or 6 and that love of it has never diminished (though I'm a fan of most genres) and I loved seeing new Aussie rock bands making it big like Baby Animals and Screaming Jets. Stop the World was a great track and couldn't understand why it wasn't as big as Better, but as you said it didn't have as catchy a hook as Better so that would explain that. I always thought 'Sailing On the Seven Seas' was a poor man's 'Personal Jesus', though it's not bad. I didn't realise the 'band' was just the singer at this point. I'd forgotten about it going top 5 in WA. I remember seeing it in the state top 10 lists and finding it odd. I liked 'This House' a lot. I always pair it with Tara Kemp's 'Hold You Tight' for some reason. Had no idea she was only 14. I wonder if she changed the spelling of her name, as there was already an Italodisco artist named Tracy Spencer. The Triplets song is one of those I had completely forgotten about until thinking of it a few months back. 'Last Train to Trancentral' is a classic. I'm surprised they didn't continue to record under the KLF moniker after their '91 success. Wanda Dee, whose "come on boy, do you wanna ride" line was sampled (and appears in the video after legal intervention), got to program rage on the back of marketing herself as 'The KLF' in 2004 - one of the strangest guest programmers ever. Never knew John Farnham sang back-up on 'Higher Than Hope', but it seems obvious knowing. I'm surprised to see the video isn't on youtube, but as 'The Horses' is on a Vevo channel, maybe it has been blocked.